The framework for ridding the world of Syria's chemical weapons may be tactical, but the challenge it poses is technological. We have, it seems, a deal. That's all we have at this point, though, when it comes to getting rid of the chemical weapons that were used last month in what Ban Ki-moon, today, called "the most significant confirmed use of chemical weapons against civilians since Saddam Hussein used them in Halabja in 1988." 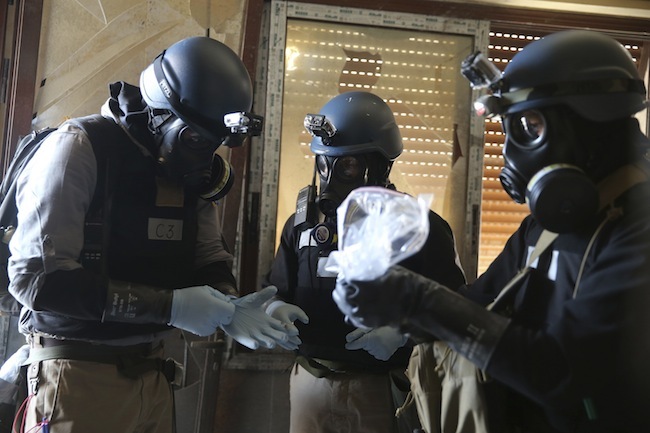 Syria, it's estimated, has some 1,000 metric tons of chemical munitions -- including sarin, blister agents, and mustard gas -- in its possession, some of them, it's believed, stored in underground bunkers. Assuming that 1). Syria, under the notoriously mendacious Assad regime, actually follows through on its promises, and 2). U.N. inspectors can actually find the weapons Syria has stored in stockpiles hidden throughout the country … what then? What, actually, will be involved in destroying the weapons? A lot, unsurprisingly. A lot of money, of time, of effort. The U.S. itself, it's worth remembering, has still not completed the task, began in 1980, of destroying the chemical weapons it amassed during earlier military efforts; last year, we, along with Russia, missed the deadline to have that work completed. The U.S. effort has cost some $35 billion so far. Undertaking a similar task in the tumultuous context of a war-torn nation will be proportionally more difficult and expensive and confusing and, potentially, dangerous. It will be a challenge of vaguely Borgesian dimensions. But what will the challenge actually involve? Below, with the caveat that the process varies greatly according to the weapons being treated and the location of the treatment, is the general process for taking the "deadly" out of "deadly weapon." First, you have to separate the chemical agents from the non-chemical components of each weapon. Typically, this will involve breaking down each device into the munitions (like rockets and artillery shells), the chemical agents themselves, and, in some cases, the rocket propellant that gives the weapons their explosive power. The chemical agents will be drained from the munitions that contain them – a process conducted primarily by specially designed robots, typically (and ideally) as part of an assembly-line setup. The agents are then sent to a holding tank. Incineration, according to the Bulletin of the Atomic Scientists, was the earliest technology the United States used to destroy chemical weapons: The country began operating the first incineration facility in 1990, on the Johnston Atoll in the Pacific Ocean. As its name suggests, the technique involves burning chemical agents in high-temperature liquid furnaces to deprive them of their biohazardous capabilities. And it works, the CDC explains, by converting chemical agents "to ash, water vapor, carbon dioxide, and other products formed by combustion." When the liquid furnaces that allow it are accessible, incineration is generally the Department of Defense's preferred method for the destruction of chemical agents and munitions. There's also a wet chemistry approach to destruction -- one preferred by Russia and by some American states. Referred to as neutralization (or, sometimes, as hydrolysis), this method takes liquid agents and places them in a mixing tank with either extremely hot water or a caustic re-agent like sodium hydroxide (otherwise known as lye). Some approaches mix the chemical agent with both materials. The reaction that results from this -- chemical hydrolysis -- destroys the toxicity of the agent. In this method, the agent -- as in the neutralization method -- is mixed with water and a caustic solution, creating a byproduct called hydrolysate. The process brings the pH to of the agent to a neutral level; that, in turn, makes the new solution digestible by microbes. From there, the hydrolysate undergoes a biotreatment process, in which microbes digest and further break down the solution. Water released from the process is then recycled, leaving salts and the "biosludge" comprised of microbe waste products and other bacterial matter. The product that results is removed to a storage and disposal facility. These more experimental methods involve combining the weapons' chemical agents with other compounds to re-form them into less hazardous products -- including gases and metal alloys. In the event that the munitions also include explosives or propellants, those agents are separated from the mix and are burned in a furnace that’s especially outfitted to withstand explosive blasts. The furnace is known as a "bang box." As for the munitions themselves – the containers of the chemical agents – those likely, even after drainage, contain traces of hazardous materials. Incineration technology can be used to treat empty casings, thereby destroying any residual chemical agents (and, for that matter, any residue of their breakdown, which may also be hazardous). Typically, artillery shells and similar weapons casings are sent to furnaces that are specially designed for metal parts. The wooden pallets and cases that are used to store and transport munitions must be destroyed, as well. While “dunnage” furnaces are designed for precisely this purpose -- burning the accessory materials that may accompany a chemical weapon -- those materials, in practice, are often treated the same way as the weapons casings themselves are: They're fed through a metal parts furnace. From there, the (typically liquid) effluent -- the material that results from the weapons' processing -- moves to a second stage for further processing. The effluent is either fed into a liquid industrial incinerator or sent to undergo bioremediation -- the way we might process sewage.